It is now commonly accepted that SMBHs are ubiquitous in galactic nuclei and that their mass accretion history is linked to the formation and evolution of their host galaxies. The most striking evidence for this link is the discovery that the black-hole mass MBH is tightly correlated with the velocity dispersion sigma of the stellar bulge. The importance of the MBH~sigma relation emerges when we consider that it connects two quantities on vastly different scales, namely the SMBH on 10-5 pc scales, and the bulge potential on 103 pc scales. It thus provides a powerful on models of galaxy formation. The universality of this relationship, however, is not yet established, in particular as it is still based on a limited sample of galaxies (and mostly ellipticals and lenticulars, see figure). Several questions remain unanswered. Is the relation the same for different kinds of galaxies that most likely underwent different formation histories? Does this relation hold also for the most massive galaxies, where feedback has been invoked to quench star formation? Furthermore, what is the intrinsic scatter of the relation? Clearly, the tighter the MBH~sigma relation, the greater the challenge for our models of galaxy formation and evolution. Finally, remarkable exceptions to the MBH~sigma relation do exist, and could agree with the prediction that SMBHs may be expelled from galactic nuclei through gravitational recoil or slingshot. The MBH~sigma relation (dashed line, according to latest compilation by Gultekin et al. (2010), along with the MBH measurements used to derive it, coded according to the different type of SMBHs host galaxies (red circles indicate Es, yellow ellipses S0s and the blue spirals are disk galaxies). There is a simple reason why the sample of galaxies with good MBH measurements is small and biased. In order to measure MBH reliably, one needs to be able to resolve the kinematics of stars or gas on spatial scales DBH~2GMBH/sigma2, a crude estimate of the diameter of the SMBH's sphere of influence. Even for reasonably massive SMBHs in nearby galaxies DBH is a few tenths of an arcsec, so that almost all existing measurements of MBH rely on kinematics obtained from the Hubble Space Telescope (HST). HST, however, is a 2.4m telescope, making it prohibitive to obtain high-S/N stellar kinematics of the relatively dim central regions of giant ellipticals. It has no near-IR spectroscopic facilities to probe the dusty nuclear regions of spiral galaxies. These problems could be circumvented by using the gas kinematics, although not all galaxies have central emission and even when present, gas very rarely show clean circular disk-like motions. Adaptive-optics assisted near-IR spectroscopic facilities on 8m-class telescopes, finally gave us the opportunity to complete once and for all the SMBHs census in nearby galaxies. 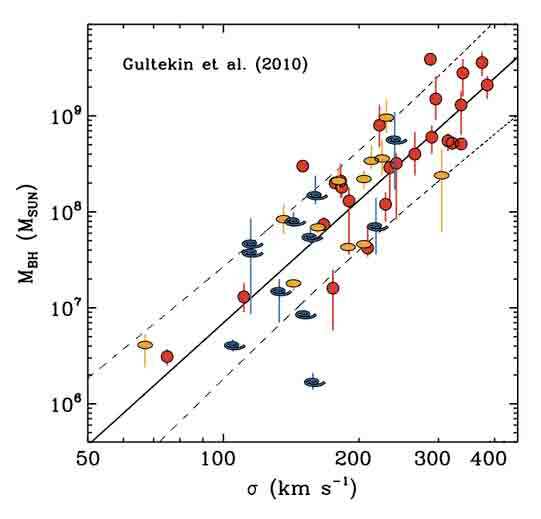 The ability to correct for the atmospheric turbulence and reach spatial resolution similar to HST, combined with the larger collecting power of ground-based telescopes and near-IR spectrographs, indeed makes it possible to measure MBH in precisely the kinds of galaxies that are currently underrepresented in the MBH~sigma relation, namely giant ellipticals and spiral galaxies. Adaptive optics observations for the spiral galaxy NGC 3705 (left, using NACO at VLT) and the elliptical NGC 1265 (right, using NIRI at Gemini). Both panels show the central near-IR spectrum and the HST image of the galaxy, where the natural guide stars used to perform the AO correction are clearly visible. Planetary Nebulae (PNe) in external galaxies are mostly regarded either as tracers of the gravitational potential or as indicators for the distance of their galactic hosts, with the latter advantage owing to the almost universal -- though not fully understood -- shape of the PNe luminosity function (PNLF, generally in the [OIII]5007 emission). Yet extra-galactic PNe can also be used as probes of their parent stellar population and understanding in particular the origin of the PNLF is a puzzle that, once solved, promises to reveal new clues on the late stages of stellar evolution and on the formation of PNe themselves. The careful modelling of the stellar background in integral-field spectroscopic data allows to detect the emission of single Planetary Nebulae (PNe) in the optical regions of early-type galaxies down to flux levels otherwise inaccessible to standard narrow-band photometry. This makes it possible to trace the PNe luminosity function (PNLF) up to a larger completeness limit and in galactic regions where stellar populations gradients are the most extreme, and therefore where the study of the shape of PNLF and of how it originates from the bulk of the galactic stellar population could be the most interesting. The figure below shows maps for the [OIII] emission from SAURON data for M32 and the nuclear regions of M31, and shows the position of several PNe, most of which were previously unknown. 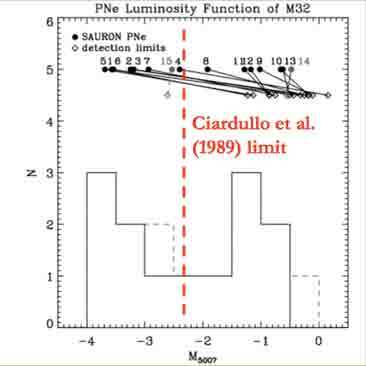 The figure below shows the PNLF of the M32, as derived from the SAURON observations, which extends to source 5 times fainter (2 magnitudes) than previously found through narrow-band imaging (for similar exposure times). 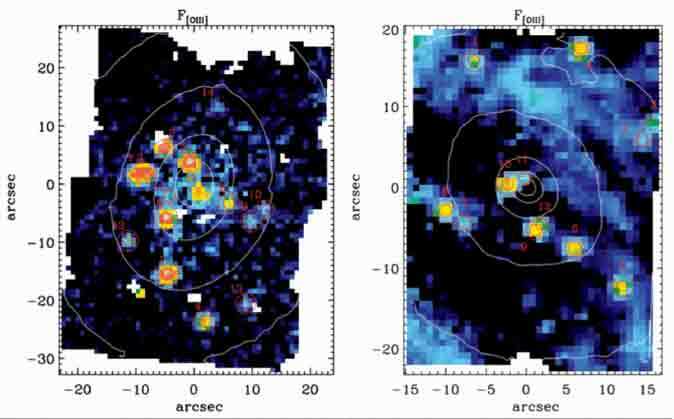 These observations demonstrates the potential of integral-field spectroscopy to study the extra galactic population of PNe, which will soon flourish with the advent of next generation integral-field units such as MUSE on VLT. According to the current paradigm for the hierarchical formation of galaxies, successive merging of stellar systems and accretion events are largely responsible for the present-day structure of galaxies. Whenever gaseous material is involved in the merging of galactic systems, numerical simulations have shown that a fraction of the gas always tends to be driven toward the centre of the remnant, where gas can settle and lead to the formation of a nuclear stellar disk (NSD, see figure). If no gas is present when early-type galaxies assemble, NSD can still form afterward from either stellar mass-loss material or the accretion of a small gas-rich companion. Two nuclear stellar discs revealed after subtracting the light of their host galaxies, the shape of which is shown by the white contours. These disks are just a few 100 pc across. Independent of whether they form during or after a major merging event, NSDs would not survive a second major encounter since they are dynamically fragile systems. This can be understood considering that NSDs have masses comparable to that of their host galaxy, and therefore would be significantly affected by the interaction with a second SMBH of similar mass, which would be carried by the galaxy with which the NSD host galaxy would merge. The simulations illustrated below (courtesy of M. Dotti) show that during such an encounter a NSD would indeed be quickly disrupted. 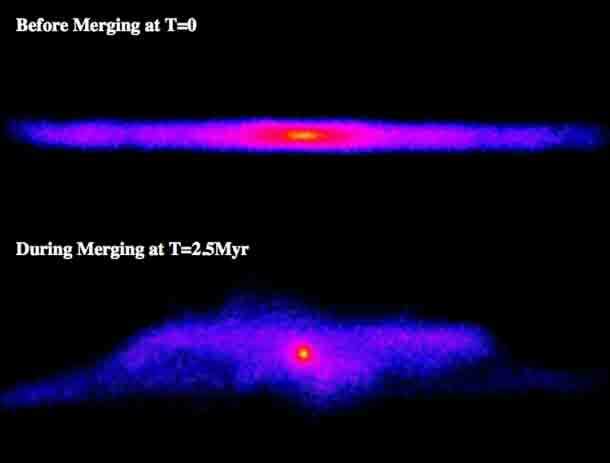 N-body simulations demonstrating the disruption suffered by a nuclear stellar disc during a major merger event. An initially stable nuclear disc orbiting around SMBH of the same mass as the disc (top panel) is considerably disrupted after just a few Myr following the impact with a second SMBH of the same mass (lower panel). The delicate nature of NSDs is what turns them into a unique tool to constrain the assembly history of galaxies. The age of the stars in NSDs can indeed be used to constrain the lookback time since their host galaxy experienced the last major merging event that determined their present-day shape. Specifically, NSDs that formed gradually after their host galaxies assembled can be used to set a lower limit on the age of the present configuration of their hosts, whereas NSDs that formed during the last major merger provide a specific epoch for this event. Using VLT-VIMOS we are currently dating the age such nuclear disks in nearby galaxies, using such integral-field data to optimally isolate the disk stellar population from that of its surrounding bulge.